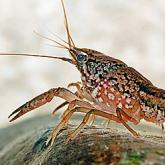 An invasive species of predatory shrimp has been found in the UK for the first time. The animal was spotted by anglers at the Grafham Water reservoir in Cambridgeshire and sent to the Environment Agency for identification. The shrimp preys on a range of native species, such as freshwater invertebrates - particularly native shrimp - and even young fish. This alters the ecology of habitats it invades, and could cause extinctions. According to the Environment Agency, the animal, known as Dikerogammarus villosus, often kills its prey and leaves it uneaten. Insects such as damselflies and water boatmen could be at risk, with knock-on effects on the species which feed on them. D. villosus has spread across most of Western Europe over the last 10 years. It can be as small as 3mm but may grow up to 30mm long, making it much larger than native freshwater shrimp. After the discovery by the anglers, an expert in Holland conclusively identified the species. Dr Paul Leinster, chief executive of the Environment Agency, said: "We are devastated that this shrimp has been found in Britain... We are currently establishing the degree of the problem, and whether the shrimp is only in Grafham Water or if it is in nearby lakes and the Great Ouse as well." The shrimp is native to the steppe region between the Black Sea and the Caspian Sea. It is believed to have invaded Western Europe via the Danube.